The internet has become a major source for Russians to research anything from clothing to motor cars, holidays to jewelry. However Real Estate is perhaps one of the industries that has perhaps benefited the most from the internet boom. With seven time zones keeping in touch with friends and family via the internet, especially in the bitter cold winters in Russia, is the only practical communication. Dreaming of owning a property abroad had been reserved for rich oil tycoons and pop stars, however the massive middle class sector in Russia has now entered the overseas property market, and many can now afford to buy a bolt hole in the sun. 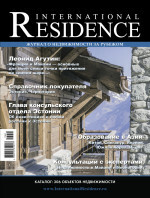 1-property.ru is Russia's leading overseas property portal concentrating only in real estate outside of Russia. 1-property.ru offers the opportunity of continuous advertising throughout the Russian speaking markets, 24 hours a day, 365 days of the year. Olesya Zubova, project supervisor at 1-property.ru said,’ we now handle over 7,000 targeted visitors every day and the numbers are growing. We work hard to produce effective results for our advertisers‘. The website is the Official Internet Sponsor of the leading overseas property exhibitions in Russia ensuring high profile promotions direct to professionals and individual buyers. These include the Moscow International Property Shows, the St. Petersburg Overseas Property Shows, the Moscow Overseas Property & Investment Shows, the Moscow Golf & Luxury Property Show and the Bulgarian Home Exhibition. Extensive investment results in the highest optimization in the Russian language search engines ensuring successful advertising for our clients. ‘We employ highly qualified staff to ensure that your texts are translated into 'intelligent' Russian rather than using low quality auto translators. The costs for translations are included in the price, explained Zubova. To find out how your company can post your property check out 1-property.ru.